The size of the space that opens before you as you turn the corner at the top of the alley (above) is surprising, extending to the rear of Arundel Avenue on land that is bounded by the new housing on Bethel Grove. When I arrived there was a healthy crowd of locals and other interested parties strolling around the garden and enjoying on the food and drinks laid on by the organisers. The aim of the project is to turn the space into an informal garden and orchard, encouraging wild flowers and wild life. What was already apparent was the progress the volunteers had made clearing and tidying the site, creating a pond, and planting fruit trees and wild flowers among the gravestones. As I had forsaken all priests, so I left the separate preachers also, … for I saw there was none among them who could speak to my condition. 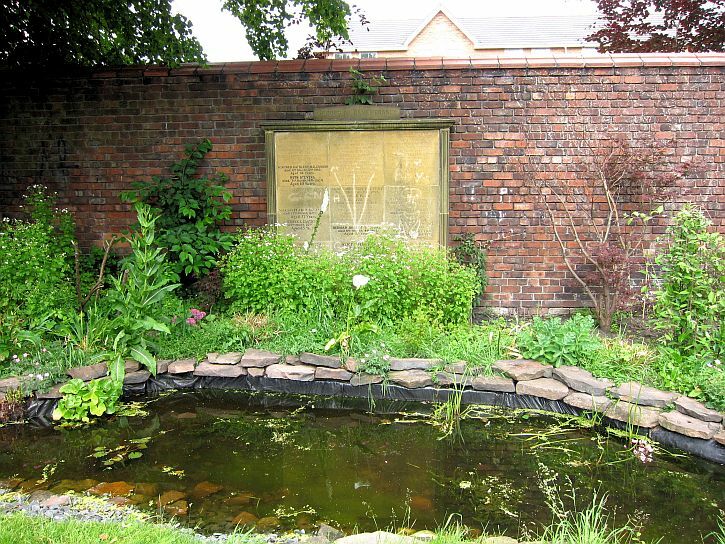 A Quaker Meeting was established in Knowsley in 1657, with Quakers gathering together in each other’s houses, sometimes in Liverpool. By the 1680s there were more members in Liverpool than Knowsley and the centre of gravity of the Meeting began to shift towards Liverpool. From 1710, Liverpool Quakers met in Hackins Hey Meeting House and the presence of Quakers in Liverpool was firmly established. The history of the Quakers on Merseyside can be looked at in more detail here on the Liverpool Quaker website. One of the fundamental beliefs of Quakers is that ‘there is that of God in everyone’- which implies no discrimination on grounds of gender or sexuality, youth or age, race, ethnicity, nationality or religion. Quaker beliefs have led to their prominence in anti-war and environmental movements. In Liverpool, from the 1780s onwards, men like John Rutter and William Rathbone IV were members of the ultra-liberal Liverpool Literary Society, whose members supported the French Revolution, Parliamentary reform, the abolition of slavery, peace with France and the reform of local government in Liverpool – all highly unpopular with majority opinion in the city. Rutter founded the Medical Institution on Mount Pleasant for disseminating medical knowledge, and the Athenaeum Club on Church Street for businessmen. The earliest record of an attempt by a Liverpudlian to discourage the slave trade originated within the Quaker community. In 1787, when the British abolition movement began, the Liverpool slave trade was the largest in the world. Liverpudlians, therefore, reacted negatively to the abolition movement, which they viewed as a threat to both the local and national economy. By 1788, the immense popular support generated by the abolition campaign left Liverpool isolated in its defence of the slave trade. Liverpudlians, however, were not unanimous in their support of the slave trade’s continuance. 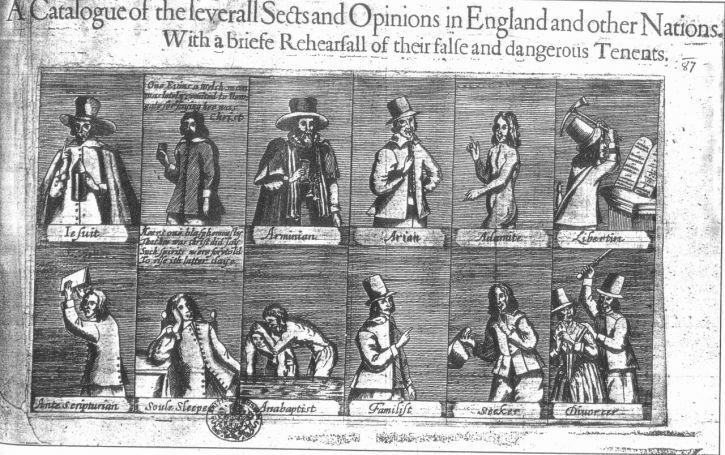 In 1787 and 1788, a small group of rational dissenters, known as the Roscoe Circle, anonymously contributed to the abolition campaign from Liverpool. The group’s namesake, William Roscoe, went on to be elected Member of Parliament for Liverpool in 1806, and in March 1807 he voted in favour of abolishing the slave trade along with 282 other MPs, against just sixteen, including Liverpool’s other MP. In 1791 the Liverpool Quakers built themselves a new Meeting house on Hunter Street (now the dual carriageway behind Central Library), where Quaker burials took place until 1854, when the Meeting received an order forbidding it to make any more burials in a densely-populated area on public health grounds. OS map, mid-19th century. 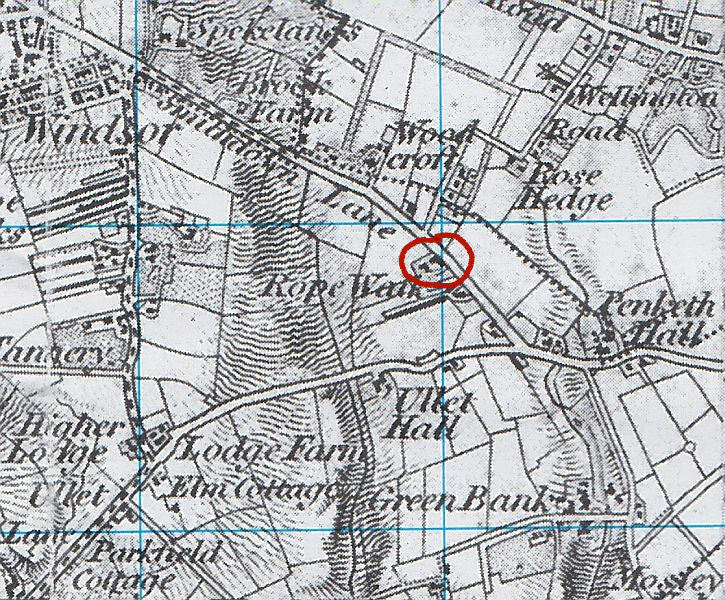 Is the circled plot the burial ground? 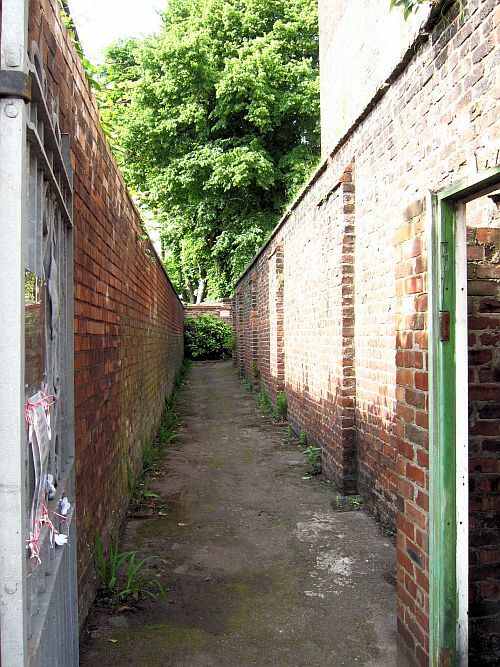 This was when the burial ground now accessed from Arundel Avenue was established – on land that had a frontage of 80 yards on Smithdown Lane (as it was then known) and extending back for about 100 yards. 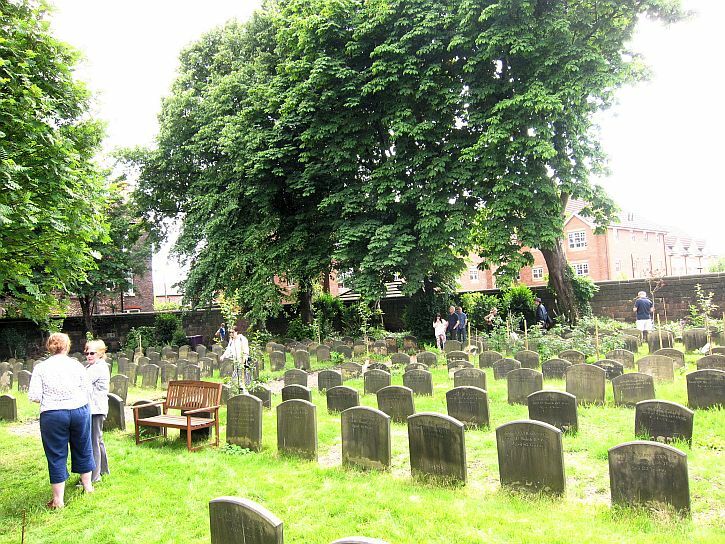 The Quakers had raised the money to pay for the burial ground by selling a previous Meeting house and burial ground which they still owned in Hackins Hey in the old part of Liverpool between Dale Street and Tithebarn Street. All the human remains were removed and reburied on the new site. In 1861 a new Meeting house to seat 200 people was built on the new burial ground, and a caretaker was installed in a cottage to look after the building and grounds. 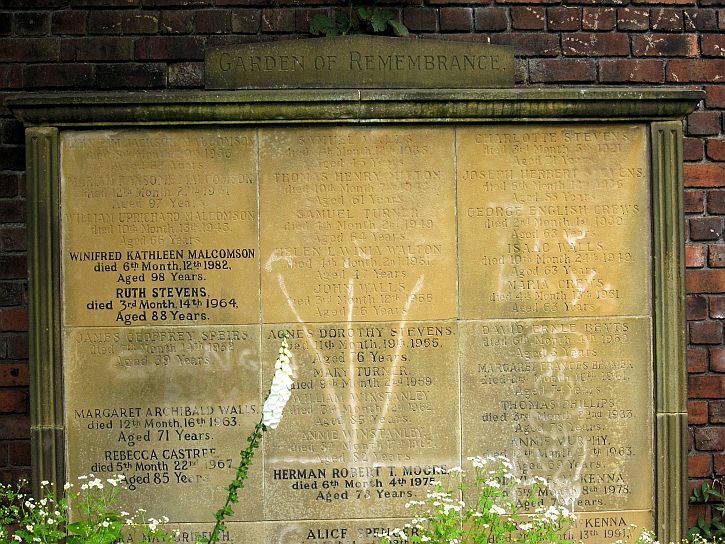 Interestingly, according to this article on the TANN website, in their earliest days of the Quaker movement, they did not mark their graves in any way. Later, Friends allowed the use of gravestones laid flat over the grave. In 1864, the committee in charge of the burial ground on Arundel agreed that vertical headstones would be allowed – but they must all be of exactly the same shape and size, with inscriptions in identical script that gave only the name of the deceased, their age and date of death. 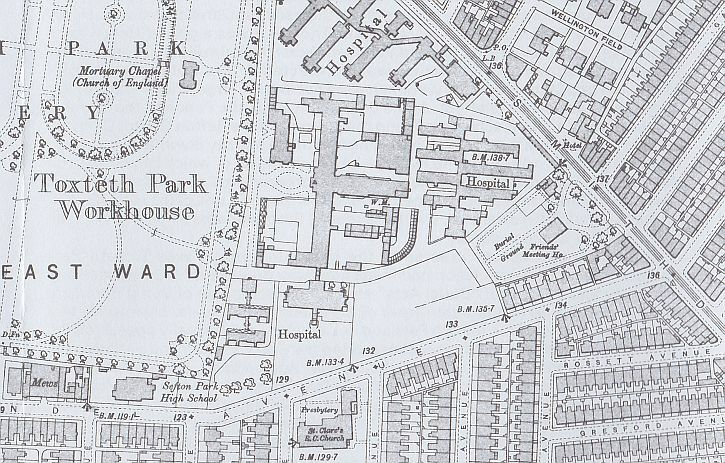 in 1906 the Quakers sold half of the site that fronted on Smithdown Road to the Guardians of the Poor of Toxteth Park who wanted to expand the Smithdown Road Workhouse (which later became Sefton General hospital), leaving the burial ground as it is today. By the 1950s the graveyard had become filled to capacity and the last burial took place in 1961. In 1977 an electrical fault caused a fire which destroyed the Meeting House. 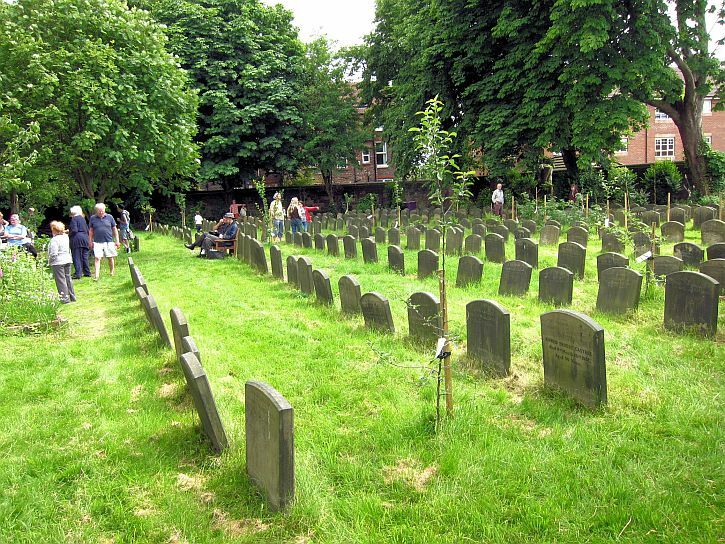 Now, with its rows of identical gravestones it is a typical Quaker graveyard of its period and will be maintained as a site of historical interest – now serving a new function as a wildlife garden for the local community. Thanks, Somkiet – I was thinking of adding something about notable Liverpool Quakers, including John Hamilton who I always really liked. This brings back memories! I used to go to Sunday evening meetings there in the late 1960s/early 70s. Fascinating post. I really must try to go there next time I’m in Liverpool. Your account took me back to when, as a teenager away from home in London, I came upon Bunhill Fields Burial Grounds completely by chance. I was absolutely amazed to find it contained the graves of Daniel Defoe, John Bunyan and William Blake – it’s a veritable Non-conformist Pantheon! Being but a callow youth though, I was probably more impressed at the time by the gravestone of poor Mary Page on which there was a long, detailed and gruesome account of her last illness. I understand Bunhill Fields is now listed and a popular lunch-time spot for office workers. Back in 1967, it was almost deserted and overlooked. It’s good that it’s still there and apparently now much better known. Thanks for your interesting response, Andimac. 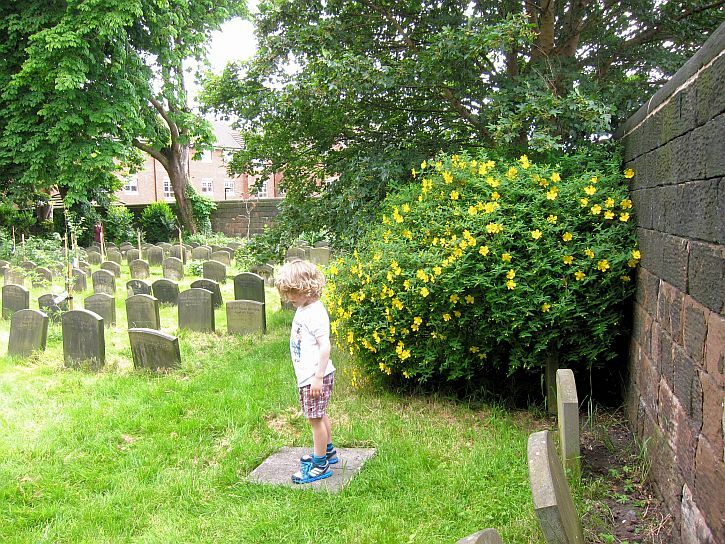 You have reminded me that months ago I read about Bunhill Fields and thought it worth a visit. I must remember to go next time I’m in London. Interesting Gerry…My parents were living in 33 Arundel Avenue when I was born. Then we moved across the road to Sydenham Avenue. I never knew about the Quaker Burial ground but I just about remember Sefton General Hospital overlooking the cemetery. A friend of mine has just sited her first bee hive here. At least I think it’s here? Sounds like a nice way of utilizing a quiet unused space. Small world, John, we have lived on Sydenham for the past 30 years. Yes, at Sunday’s opening I was told that beehives are shortly to be sited there. Not Number One! Last I heard it had become ‘The Divine Light Mission’ although that’s probably gone now? My maternal grandfather lived on Brompton Avenue and two dear old Aunts lived on Buckingham Ave. My Stepdaughter lived on Rossett Ave just off Arundel until recently. Small world indeed. PS…I always thought you lived in Formby for some reason. Perhaps it was your cover photo. No – 23. Number 1 (was that where you lived?) has always been in private ownership for the 30 years we’ve been here. The Divine Light Mission website now lists 4 Chester Road, Tuebrook as one of the ‘places across the world where disciples of the Lord are living and where satsang (spiritual discourse) can be heard’. Well, it takes all sorts, as my mum would say. Thank you for all you share. We once lived in Halkyn Avenue up to 1967 little did we know the opening we could see from the kitchen window was the Quaker burial ground! Thank you for all the history lessons not taught to oldies such as I! Super photos. So grateful and to be able to Share on FB for others to enjoy. Thanks for comment, Pauline. I have lived in the avenues since 1983, and – like you – passed that alley gate without knowing what lay beyond!